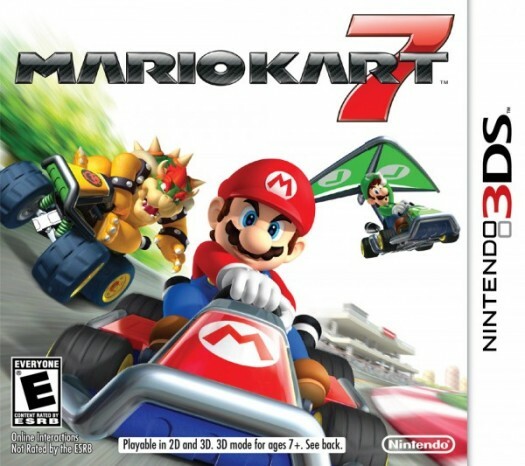 Mario Kart 7, which was recently released December 4, has lived up to its name in its best sequel yet. Though there are some disappointing factors, the new additions make up for them. The controls are the smoothest controls ever presented in the Mario Kart franchise. And it is because of that reason that I can’t put this game down. In recent Mario Kart games, controls have been offset, weak, and overall hard to control fluently (I’m referring mainly to Mario Kart Wii). The things I’m disappointed in include that they have taken away the choice to create custom races. If you want to race against opponents, you have to do a either grand prix, online matches, or race against ghost; if you have online access, though, it is just as fun. Also, the character roster is at a low 17 characters. The factors that played a key role in bringing Mario Kart 7 into the spotlight were the kart customization and the ability to glide through the air on a glider or parachute, or even drive underwater with a propeller. Kart customization is my favorite part of this game. You get to choose out the body, wheels, and type of glider. It is very similar to that of the customization that was used in the duel mode of Mario Party 5. However you could not fly in Mario Party 5, let alone any other Mario Kart games. The items are pretty similar to the previous items. The added item is called a Lucky 7. This item only appears if you are behind. The highest place I know of to get it is 5th place. If you do happen to get it, 7 different items will appear circling around you to use at your own free will. Also making a comeback is my dreaded enemy, the blueshell. This shell, which is usually fired by someone who is losing, travels down the main path hitting everyone in the way. It then hovers over the player in first and explodes hitting anyone else in the area. Seeing how any skilled player can always be in first, this is something to despise. Luckily you can watch the player tabs at the left of the screen to see if someone has a blueshell. If someone does have one, you can slow down into 2nd and stray to the side. If you are too far ahead to get into 2nd . . . well then you’re out of luck. As long as you master flying, drifting, and dodging blueshells, this game is actually easier than the previous ones. And just like Mario Kart: Super Circuit, and Super Mario Kart, coins have made a comeback. Throughout each race, coins are scattered around. Whether it be in the air, on land, or underwater, coins are very important. You can collect up to ten coins at a time, and each coin gives you a small boost and raises your speed. As well as helping you win the race, after collecting a certain amount of coins, you unlock a new part to use in customization. There are many parts to unlock and each part is unlocked at random all the way up to 5000 coins. Then there are golden parts. These parts are only unlocked after accomplishing a very difficult task such as completing every grand prix in every class with at least 1 gold star. This will get you golden wheels. Collecting 10,000 coins or getting 100 street passes gets you a golden glider. And getting up to 10,000 VR points from online races or getting a massive 20,000 coins, get you the golden body. Good luck with that one. While Mario Kart 7 has extremely good controls, it lacks many wanted factors such as more characters, custom races, and even a better connection online. However, despite the disappointing factors, this game is simply amazing. I literally can’t stop playing it! There is so much to do, and after it’s all done it’s still fun to do time trials, race ghosts from around the world, and race online. And unlocking everything is a good challenge now with the coin system, meaning that even though you can be an expert, it still takes many races in order to unlock things. The sounds of this game are perfect as well. And only one glitch has been caught so far, which is good compared to other games’ glitch rate (like all of the Call of Duty games). If you have a 3DS, this game is more amusing than Starfox and Super Mario 3D Land. And it’s almost as equally entertaining as Ocarina of Time. That’s quite a compliment. If you don’t have a 3DS…then I would get one just for this game. Good but in my opinion Mario Kart 64 was the best.